We’ve all probably heard about prepping. Prepping is a slang term for being prepared for disasters or emergencies. The main idea is that you’re prepped, or prepared, for emergency situations. And in your homes, many things can happen with no notice including natural disasters, shortages of available food, power outages, plumbing problems that require water shut off to the home, and equipment breakdowns (like heaters or air conditioners). When your home’s equipment breaks down, it’s a more personal matter than when a whole city goes black with a power outage or a storm destroys a populated area. But it’s still something that will cause you equal suffering at times. Our homes are meant to provide us with protection from the outdoor elements. So when your heater or air conditioner goes out, you’re probably unprepared for the situation. Having to call someone on a spur of the moment notice isn’t always easy. And it can be hard to know who to trust when it comes to finding a company who will make honest repairs at fair prices. This is one reason you’ll want to be prepared for the upcoming summer season here in Buffalo, MN. 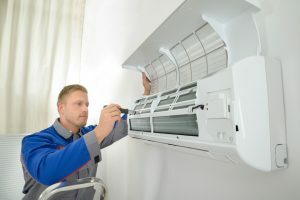 Prepping for the use of your air conditioner this summer involves not only being prepared with a good company in mind to make your repairs if needed, but also involves having services performed by them that can help you avoid emergency situations where your unit breaks down unexpectedly. Air Conditioning Tune-Ups should be performed at least once a year prior to the season changing into warmer days where you need the air conditioner. And Spring is definitely on it’s way to us here in Buffalo. Warmer days are ahead, and we’ll soon be able to say, “see you again soon,” to our cold days and nights. This makes it the right time to consider getting your air conditioner tuned up. You’ll want to make sure it’s in top running condition this summertime so you can save on energy costs and also count on it to run with less chance of breakdown or repairs needed. Prep for summertime this year with an air conditioner tune-up and you’ll be glad you did. Preparing to avoid additional complications during an emergency is going to serve you well. You’ll be less stressed if something does happen because you’ll know who to call and the company that serves you will already know everything about your unit. This alone will make the repair more efficient and quicker. At DeZiel Heating & A/C, we have helped many homeowners in the Buffalo area with tune-ups to prep for the humid, summertime heat in our area. We’re familiar with conditions in this part of the country, and know just what you need when it comes to keeping your home cool. And in case something does goes wrong, we’re available any time of day or night you need help. We service the west metro, all of Wright County and surrounding cities with expert air conditioning tune-ups and repairs or replacements. For all your HVAC needs, keep our number handy for the best prep and emergency services around! If you would like to learn more about Air Conditioning Tune-Up, please call 763-684-3965 or complete our online request form.